2010 marks Tonio’s first full F1 season with the Force India Formula One Team following 18 months as its test and reserve driver. Tonio joined Force India to fulfil the crucial development role for its debut Formula 1 campaign in 2008 and moved up to a race seat from the 2009 Italian Grand Prix. The Italian has a rich history in the junior formulae. After success in the domestic and international karting championships, he won karting’s equivalent of Formula 1 in 2001. That same year Tonio also finished second in the German Formula Renault Championship. During 2002 Tonio contested the German Formula 3 Championship and established his reputation as one of the quickest drivers in the series. Three pole positions, three podiums and a dominant pole to flag victory in the San Marino International Formula 3 race at Imola displayed his true potential. In 2003 Tonio contested the FIA F3000 International Championship and again success quickly followed as he finished fourth overall. His 2003 performances earned him the lead drive with that year’s championship winning team, Arden International, for 2004. Taking seven wins from a total of ten starts, including nine pole positions, Tonio stormed to the championship. 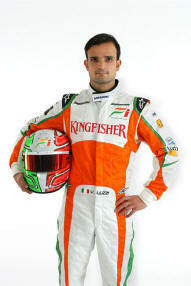 The Italian holds the joint all-time record for F3000 wins along with Juan Pablo Montoya and Nick Heidfeld. For the 2005 season Tonio joined the newly formed Red Bull Racing team in Formula 1. With David Coulthard confirmed as one race driver, Tonio and Christian Klien shared the second seat, with Klien getting three races before Tonio finally made his F1 race debut on home soil at Imola. Scoring the final point on offer was certainly a promising start, but he only retained the car for further three races before Klien took over for the rest of the season. Tonio moved to sister outfit Toro Rosso in 2006, where he remained for the 2007 season. Inclement weather conditions at the 2007 Chinese Grand Prix gave the team the opportunity to grab points and Tonio took a career-best sixth. A swap to Force India beckoned and Tonio now looks forward to his first full season since the move, with the aim of securing solid points finishes throughout the year.